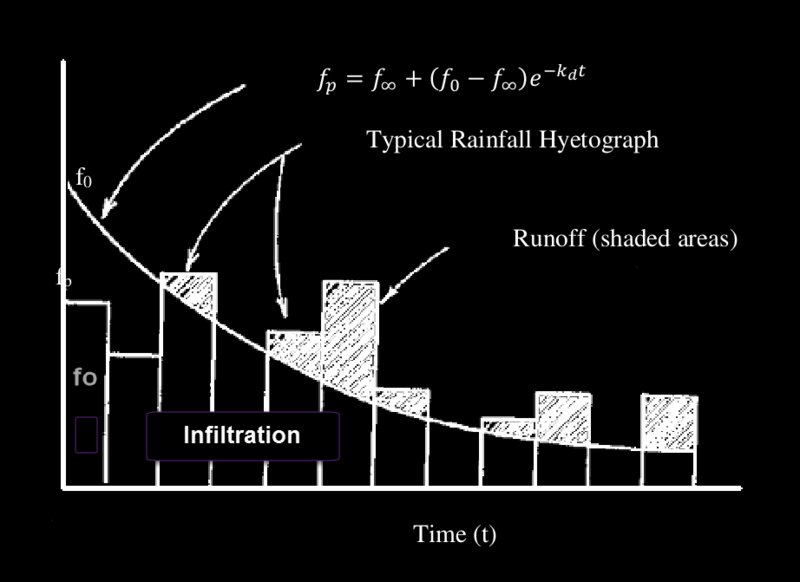 This method is based on empirical observations showing that infiltration decreases exponentially from an initial maximum rate to some minimum rate over the course of a long rainfall event, as shown in the following figure. 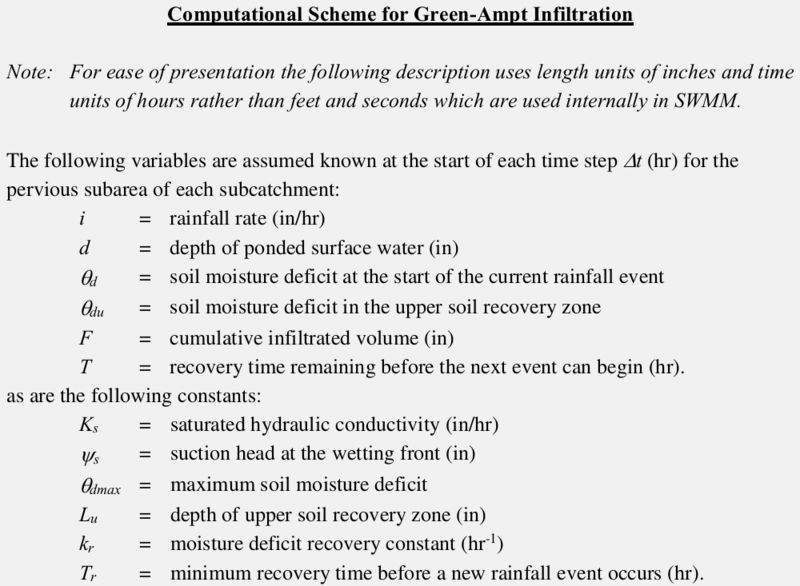 The Green-Ampt equation is a physically-based model which can give a good description of the infiltration process. This method for modeling infiltration assumes that a sharp wetting front exists in the soil column, separating soil with some initial moisture content below from saturated soil above. 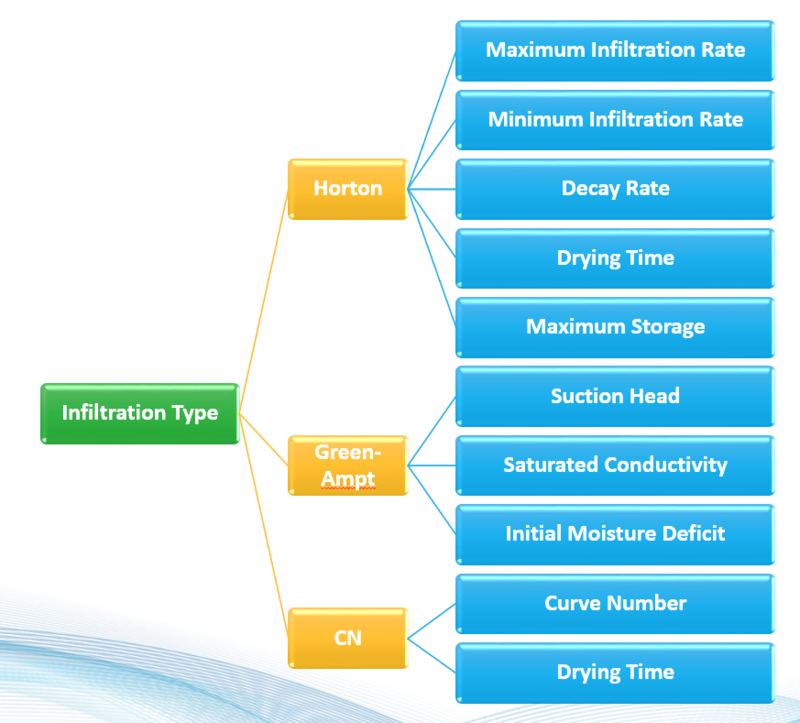 The input parameters required are the initial moisture deficit of the soil, the soil’s hydraulic conductivity, and the suction head at the wetting front. This approach is adopted from the NRCS (SCS) Curve Number method for estimating runoff. It assumes that the total infiltration capacity of a soil can be found from the soil’s tabulated Curve Number. During a rain event this capacity is depleted as a function of cumulative rainfall and remaining capacity. The input parameters for this method are the Curve Number, the soil’s hydraulic conductivity (used to estimate a minimum separation time for distinct rain events), and a regeneration constant that describes the restoration of infiltration capacity during dry periods.